No Quarter Given | Comics I Don't Understand - This site is now being updated daily at http://www.comicsidontunderstand.com. Please change your bookmark if necessary, and notify any web site with a link to the old address. Jack Applin: Is it that girls are stingier than boys? 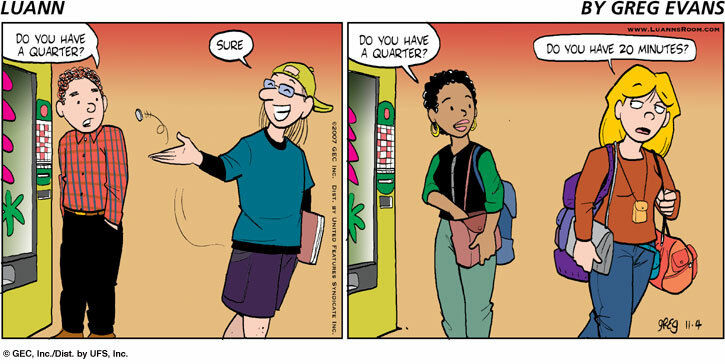 Does Luann work for 75 cents an hour? Is it reverse panhandling, where if I lend you a quarter, I get to tell you my life’s story? Is it simply that Luann is overworked, and so wants some time? And a big hello to everybody visiting us from the Linguaphile group. Yupparoonee. I’m not going to say that either I or “most” womenfolk are “like that”, but that’s certainly the joke being made here. Powers, I know one guy (note: “guy”) who carries a briefcase, computer case, and messenger bag to every meeting. No little bag around his neck, though. It can be quite the archaeological dig to find something in a purse. It always seems that whatever it is that you are looking for has migrated down to the bottom, and you have to empty it all out to find it. I’m sure. even though everybody else said it already, I’m just another womenfolk checking in. and yes, she seems to have FIVE bags. just another evidence of how life is easier for men . . . and this reminds me a bit of the Iphone commercial where the guy is talking about how he needed “a little bag” to carry all his gadgets before the Iphone came out–OH THE HORROR!!! A MAN PURSE! Well, when I worked as a cashier I always dreaded it whenever a woman handed over a few bills, then told me to “wait, I’ve got the change too.” That meant 5 minutes of standing there while she dug around trying to find exact change and the line built up behind her with angry-looking customers. With the men, they either had the change or they didn’t. But for some reason, the women would have change strewn all over the place. There’s a little bit here, a few cents over there, a nickel in this compartment, a few quarters at the bottom of this bag… I don’t know why it’s so hard to keep it all in one place, but apparently it’s quite impossible for some people. For some reason, even with only one purse (and no matter what size purse it is), the one thing I need to find is always at the bottom, and getting to the bottom takes time because of the reason I carry a purse in the first place. I don’t have this particular problem with change (that’s why I have a change pocket in my wallet), but everything else I need does migrate to the bottom of the bag, and to the most inaccessible corner. My interpretation is they are referring to the saying “call someone who cares”. When someone is complaining about something and you cut them off and hand them a quarter and say “call someone who cares”. So this person is asking for a quarter and the woman is asking if she can talk to her about personal problems in exchange.